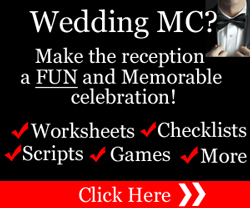 Mark Livingston here and I'm delighted to welcome you to WeddingMC.org, the website that shows Wedding MCs how to create a FUN and Memorable reception for the bride and groom. 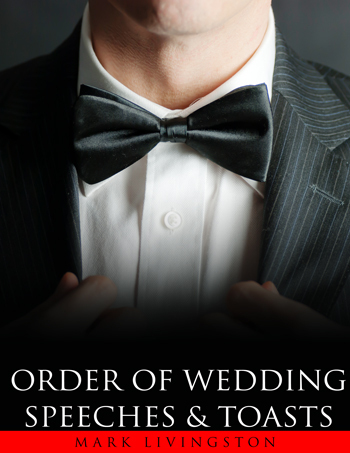 Every Wedding MC must have as part of his or her MC "Playbook" the Order of Wedding Speeches. The Order of Wedding Speeches is a vital part of the agenda if there are speeches and toasts at the reception – which there usually are. And usually, the Order of Wedding Speeches will be similar to the Order of Wedding Toasts. In my FREE Special Report, “Order of Wedding Speeches” you’ll have a working guide as you prepare for the reception. Use it as a framework for discussion when you sit down with the bride and groom to work out the agenda. Whether you live in Canada, U.S., Australia, New Zealand, United Kingdom, the Bahamas, or another English speaking country, my Order of Speeches at a wedding reception will help you plan your agenda or run sheet. Best wishes with your Wedding MC duties! FUN and Memorable reception for the bride and groom.